SUNDAY FROM 11 AM UNTIL 4 PM. WE ARE OPEN 6 DAYS A WEEK - CLOSED MONDAYS. BEST PRICES! BUY WHERE THE DEALERS BUY! 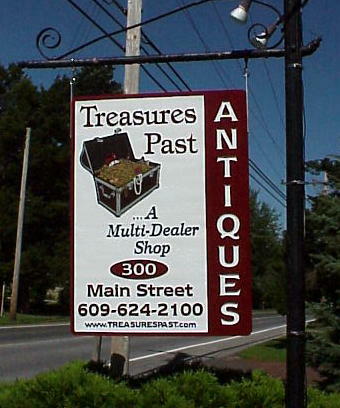 Treasures Past Antiques, a multi- dealer shop, has the best selection of quality antiques in the South Jersey area, offered at reasonable Country Prices! WE'RE EXCITED TO ANNOUNCE THAT WE'LL HAVE A SPACE AT STAINTON'S IN OCEAN CITY AS OF MAY 1ST!